Atlanta...On Aug. 28, the district court in Haifa, Israel, ruled that the State of Israel was not responsible for the 2003 killing of Rachel Corrie, a 23-year-old U.S. peace activist who was crushed by an Israeli bulldozer as she attempted to nonviolently prevent the demolition of a Palestinian home in the southern Gaza Strip town of Rafah. Israel's policy of home demolitions has been widely criticized by human rights organizations as a form of collective punishment. It violates Israel's obligations under the Geneva Conventions. The Corrie family had requested $1 in symbolic damages and legal expenses. U.S. Ambassador to Israel Daniel Shapiro and human rights groups and have criticized Israel's investigation of the case for a lack of thoroughness, transparency, and credibility. "The killing of an American peace activist is unacceptable," said former U.S. President Jimmy Carter. "The court's decision confirms a climate of impunity, which facilitates Israeli human rights violations against Palestinian civilians in the Occupied Territory." Approximately 94 percent of Israeli military investigations of soldiers suspected of violent criminal activity against Palestinians and their property end without indictments, according to the Israeli human rights organization Yesh Din. And, 91 percent of investigations into crimes committed by Israeli civilians against Palestinians in the Occupied Territory also end without indictment. In this case, the district court judge ruled that the drivers of the bulldozer could not see her, despite eyewitness testimony to the contrary. 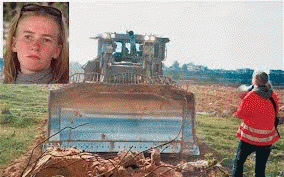 In response to the verdict, Rachel Corrie's parents Cindy and Craig stated "We are deeply saddened and troubled by what we heard today in the court of Judge Oded Gershon. This was a bad day, not only for us, but for human rights, for humanity, the rule of law, and the country of Israel...Rachel was a human being who deserved accountability, and we as her family deserve that too." In contrast, the family of James Miller, an Emmy Award-winning British filmmaker killed by Israeli forces in Rafah two months after Corrie's death, ultimately received over $2 million in damages from the Israeli government. The government of the United Kingdom had threatened to seek the extradition of the Israeli soldiers in question. "I hope that the U.S. government will use all reasonable means to ensure that the rights of American citizens are protected overseas and that justice is done for the Corrie family," said former President Carter. A not-for-profit, nongovernmental organization, The Carter Center has helped to improve life for people in more than 70 countries by resolving conflicts; advancing democracy, human rights, and economic opportunity; preventing diseases; improving mental health care; and teaching farmers in developing nations to increase crop production. The Carter Center was founded in 1982 by former U.S. President Jimmy Carter and former First Lady Rosalynn Carter, in partnership with Emory University, to advance peace and health worldwide.